There are plenty of suggestions about how to educate new users to help improve the quality of posts. We already have a tour, MCVE and the help centre in general. All of which contain pages of information that would require a fair amount of time to digest and understand. I for one, found me feet by asking, paying attention to comments and learning from my mistakes and can honestly say that I've rarely read any of those pages in detail. I'm not sure asking new users to read something in addition to what is already there is going to prevent the type of questions that they will ask. There is the click through mentality where they will see a next/continue button and carry on. Why not have something interactive, similar to how we have review audits for reviewers, where we are tested and have to make a conscious decision in order to pass the review, at which point we are presented with a "Congratulations" or "Stop... Pay attention". The purpose of the tutorial would be to highlight what the community deems to be good and bad when it comes to posting. This tutorial would make all new users (and possibly persistent offenders) review and judge the quality of some sample posts. They would have achieve a pass threshold (which is open to suggestions) in order to be able to continue. Users could be presented with posts that are good, bad and down right ugly alongside advice that highlights what is expected of questions / answers. On the right hand side would be links similar to the Asking help content, that could popup a dialog with a few short lines / bullet points that provide information. Or instead of the full list, perhaps just some specific points about the current item that is being reviewed, so if they are unsure of how to vote, there will be relevant options there to highlight what the potential issues with the post are. In the tutorial, after each review item has had a decision cast on it, a dialog should appear alongside the question to highlight exactly why it was good, bad or ugly, so the users can see what is expected and hopefully learn from it. Reviews for questions and answers would test all of the standard items that appear in the review queue. The voting choices are simple, but they would require some attention to the post that is being reviewed. If the user fails, we don't want to block them, so they should be able to retry immediately to hit the pass threshold. Hopefully they would pay more attention if they fail the first time. While there could be a click through mentality with this, hopefully with a good choice of posts to review it could be made slightly challenging so that it wouldn't be a simple case of being able to guess at the correct answer by looking at the post. This proposal is not intended to be complicated and take a long time to complete, it should be quick and simple to step through, as review audits are. A user that is paying attention should be able to go through a few reviews in a few minutes, which in the grand scheme of the amount of time they might spend on the site is a small fraction of time where they might learn something of value. Compare these few minutes of practical against the amount of time it would take to go through the tour, understand what MCVE is and read the content of the help centre. How to tailor the posts? Sample posts should be as generic as possible and not require an in depth knowledge of a specific technology or tags. Most developers should be able to understand a post that has some simple question text with a little bit of code. We don't want the sample posts to prevent people from being able being able to get on with the tutorial. A few favourite or specialist tags could be selected prior to the sample post selection so we could tailor it, although with the amount of tags in the system it may be hard to produce enough posts that are suitable for the review if more obscure tags are selected. Users could also have a skip option if they are unsure about the correct choice on a specific post, which wouldn't count against them. In this scenario they would still see the feedback about what the correct choice should be and why. If we can't teach people how to do good reviews in the time it takes to get 2000 rep, how are we going to teach new users with few skills how to write a good question? Sure we could just stop them from asking, but that then hurts Stack Overflow - new users are already complaining about perceived elitism and bullying. The current system alienates (or causes angst to) enough new users already, we have to deal with enough complaints on Meta as it is - now we want to alienate even more users by denying them the ability to ask their first question? We could talk all day about the quality of new users and why they are the way they are, but one thing remains: you can't fight the tide, you must work with it and manage it which we already do. I'm not convinced that putting road blocks in the way of these users - especially when we already have significant automated and manual measures in place for dealing with identified users - is going to be particularly productive. So let's say we don't prevent the users from asking their first question, but we do make them participate in a mini quality oriented test. If you think this is going to work then you haven't heard of the dancing pigs phenomena - these users are fixated on getting an expert answer to their question right now, and a quality oriented test is going to have a negligible effect on most of them because they cannot be educated to the desired level in such a short space of time. So, a user comes to SO looking for help on java and is asked what they think of a haskell question... I can see that ending badly. Getting them to indicate the tags they are interested in up front would probably not work well, as the list of tags is huge. It might be better to audit new users after they have made a few posts, so the system can guess the tags they are interested in, and only if they have made posts that are not well recieved. If the system has enough smarts to broadly identify the kind of problems there are with a new user's posts, it could tailor the review to those problems. I think it's too much of a barrier. How do you know you will be giving good examples of questions to rate vs. just confusing people? There isn't unanimous consent all the time as is. And as pointed out by @Raedwald, a critical reading of a question is complicated by the language used. My pre-flight questions proposal is three checkboxes, shuffled from a known list. If the system knows what check boxes a user ticked, whether they went back and reviewed their question because of it, and what happened to the question after...you get metrics. The key w/pre-flight is crowdsourcing of friendly tips and see which ones have an impact. Quick, light, fun...from the site that brought you unicoins and winter hats. This proposal sounds like it might just seem even more elitist. Better to keep the focus on a good first experience--that's what gives people an incentive to invest more into learning and improvement. Adding mandatory hurdles to asking questions is a non-starter. We absolutely do not want to annoy new users. Forcing them to click through some "let's review some questions first" dialogs is going to make most people (including people who would ask good questions) go somewhere else. On the other hand, making it completely optional means that the majority of problematic users aren't going to ever see it. If they don't read the stuff we show them now, they certainly aren't going to jump through any other hoops. So, we've got a bit of a paradox. We don't want to annoy the good, but the bad and the ugly won't click anywhere other than posting their question as quickly as possible. Honestly, the existing downvotes and closevotes go pretty far to educating new users. I think we'd have better luck expanding what already works instead of tacking on additional hoops that people have to jump through. Just thinking out loud, but the piece that seems missing is that after a post has been downvoted and closed, it's not very likely that it will ever be reopened, even if the user improves their question. So there isn't much incentive to improve questions. We need to make this pathway much smoother, to both new users whose questions have been downvoted and closed, and to users who are downvoting and closing questions in the first place. Your question is amazingly clear and well documented (and describes well the Wild Wild West situation here at SO :)), however, it just adds an extra barrier for new users. But remember your first post: you probably did an OK job, because you already saw other posts, and you're polite enough to know how to ask (not only on this site, but to your colleagues, to someone you don't know). Adding an extra "tour" will probably block the ones who don't respect others like you do, but will also block nice, beginner people who sometimes ask okay questions (with some help from the others, editing) and improve with time (like we all did), and sometimes - willingly or not -,raise an important issue. If you visited Experts Exchange once, you'll know what I mean. When some stupid bozo asks a code-dump question or totally irrelevant rant about why there are several languages, why not keep the best one, ... it gets heavily downvoted by humans and closed in minutes (and some take pleasure in doing so I may add). But in the end only humans are able to detect if the post is on-topic or not. And the moderation privileges policy awarded to standard users allows to eventually delete the offending post, most of the time without the need of moderator intervention. The thing that annoys me is that such questions get upvotes or lame answers (which also get upvotes). In that case, it's difficult to delete them afterwards. SO is hugely popular and popularity has its drawbacks, yes, but in the end we don't want to disturb its subtle balance. One thing I think would help for new users, is simply to test if the question text contains a ?, and if not show the user a "You will get the best response, if you ask a direct question" text. Stack Overflow serves (rather well) several distinct communities of users. Among them I'd call your attention to R users. They're the scientists and engineers trying to make sure your cancer treatment won't kill you and that the bridge you drive over to get to the hospital where you receive your cancer treatment won't collapse and kill you. They largely have no idea about PHP development or jQuery or anything of the sort. They will get this wrong and be driven away from the site when they're trying to ask their very-relevant questions about how to tell whether a treatment or bridge is going to kill you. Please try not to waste too much of their time fighting the deluge of crap questions. I do not believe the actual level of elitism shown by this discussion topic! I have seen more than one question severly downvoted or placed on hold simply because some of the large rep number people didn't get it, not because the question was actually bad. I think that in general a question being asked deserves a least a bit of consideration, chances are the person asking has a real problem, so instead of just moving on why not try to see their point and help them. Suggest ways to make the question better in a positive way - that seems to not happen very often, rather some flip comment or down vote. If the question truly is duplicate putting a reference to the original is fine but simply closing it seems mean spirited, let people answer it anyway who is hurt and maybe some of the newer people can get a chance to help someone else. Overall I guess what I am trying to say is that no question is bad or stupid if the asker is really stumped - remember you were a beginner once, give people a break. Why reviewers have review audits but not people who post questions or answers? 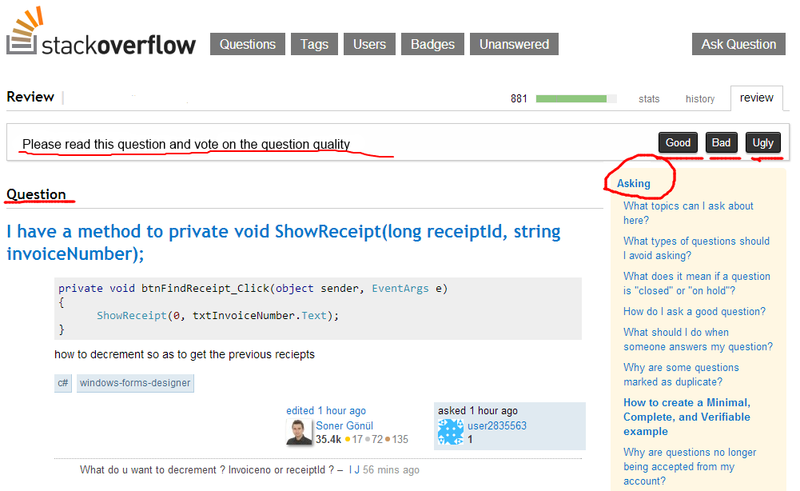 Is using Stack Overflow for gimme codez questions encouraged?